The discovery of seven terrestrial planets orbiting the same star was announced in February 2017: astronomers and the public were very excited because at only forty light years away this system is practically on our cosmic doorstep. Some planets of the system called TRAPPIST-1, after the Belgian telescope in Chile that originally found it, could even harbour liquid water – and thus might be inhabited by life as we know it. 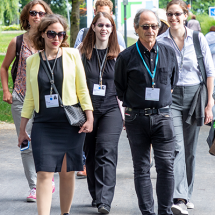 One of the authors of this study is Didier Queloz, who was also part of the very first team to discover an extrasolar planet, or exoplanet, in 1995. Back in the mid-1990s, many astronomers thought that they would find numerous copies of our solar system. Instead, they found strange new worlds, for instance large terrestrial planets called super-Earths that often orbit their stars closely. Even Proxima Centauri, at 4.24 light years our closest neighbour, probably has at least one terrestrial planet orbiting its star within the so-called habitable zone, as researchers announced in August 2016. And Proxima Centauri is a red dwarf star, just like TRAPPIST-1. “But how can we ever reach these distant worlds?” scientists and science fiction authors alike have asked for more than a century. One thing that is remarkable about this topic is that the line between science and fiction constantly seems to blur. The main problem with extreme long-distance space travel: today’s spacecrafts are too slow to reach other stars – missions would span several generations. Currently that is not feasible with astronauts. But even with robotic space probes, it is hard to imagine a mission that lasts for more than a hundred years: Which instruments could function this long in space? Where would they get their energy from, especially between stars where light is scarce? And who is supposed to pay for an overlong mission like that? This is why space travel needs novel propulsion systems that can travel at a fraction of the speed of light, preferably without requiring fuel. Solar sails are a technology to achieve all this: ultra-thin reflective foils that are carried by the sunlight’s radiation pressure, or other light sources, to distant worlds. The fact that electromagnetic waves produce a faint pressure on reflective surfaces has been known since the 19th century. But beware of a common misunderstanding: radiation pressure is not the same as ‘solar wind’. The latter is a constant stream of charged particles emanating from the sun. Solar sails are not propelled by solar wind. 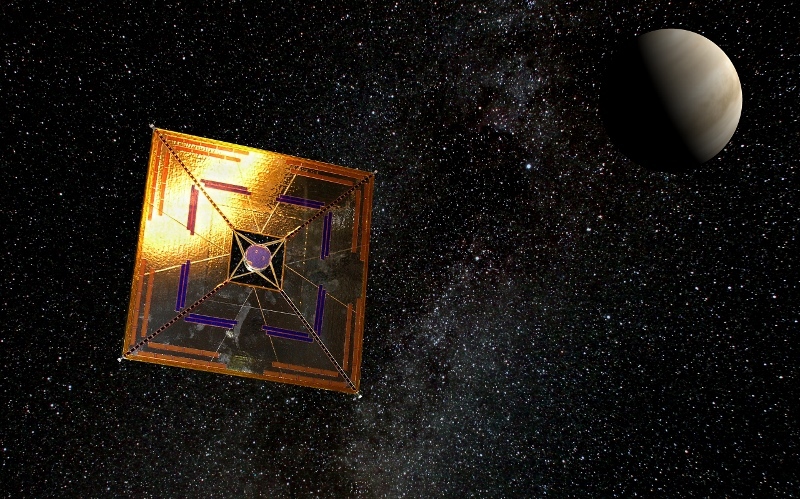 JAXA, the Japanese space agency, has the most practical experience with solar sails in space. In 2010, its solar sail probe IKAROS flew into space, piggy-back with a Japanese Venus probe. IKAROS was able to perform all its tasks: unfold its solar sails, produce energy with its solar cells and even measure the acceleration due to radiation pressure. The six-month mission was a huge success. 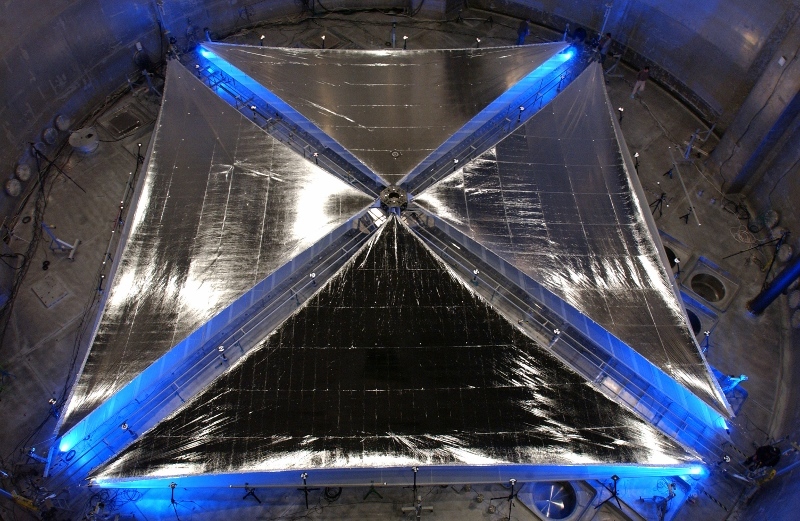 NASA has been experimenting with the unfolding of solar sails on the ground (see photo above). In the spring of 2016, an initiative of scientists and entrepreneurs announced a private research programme to boost the development of solar sail technology. 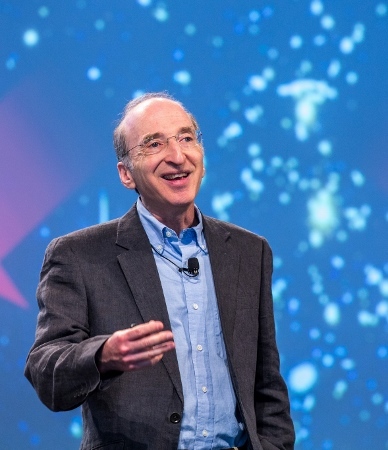 Initiated and financed by Russian-American investor Yuri Milner, two of the main proponents of ‘Breakthrough Starshot’ are the British physicist Stephen Hawkings and Facebook founder Mark Zuckerberg; Nobel Laureate Saul Perlmutter is among the advisory team. 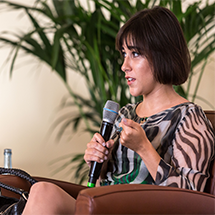 In the previous year, in 2015, Milner had founded the Breakthrough Initiatives. This larger framework has two main foci: communicating with potential aliens and spacetravel to distant stars, i.e. Starshot. Currently, Breakthrough Starshot has a starting capital of 100 million US dollars. The researchers are investigating the possibility to construct a fleet of ultra-lightweight space probes that will be launched conventionally with rockets, but will be accelerated in space with the help of focused lasers in the direction of the Alpha Centauri system. The experts are hoping that the sailing space probes can travel at 20 percent of the speed of light, meaning they would reach their destination in about 20 years. Any signal back to earth would travel another four years. “Since we won’t be working with one gigantic laser, we’ll have to combine millions of kilowatt lasers,” explains Philip Lubin, professor at the University of California in Santa Barbara and technical pioneer of the Starshot project. 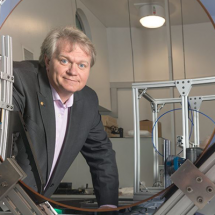 “This a huge technical challenge, because all these lasers need to be meticulously synchronised.” The researchers are planning to build a laser array in the magnitude of 100 gigawatts. Just for comparison: a standard nuclear power plant has about one gigawatt power. The first Starshot laser arrays will be built on earth, but it would make sense to position them in space: on a satellite, on an orbital space station, or even on the moon. Even if all of this sounds a bit futuristic and farfetched: just imagine if an array like that was in place – various space missions could be accomplished, not only a one-time trip to Proxima Centauri. For instance, spaceships carrying humans and cargo could reach Mars within hours. Philip Lubin originally started his research on large focused lasers with the goal to redirect asteroids coming too close to earth. So this future laser array could also be used to catch asteroids, study them and even exploit their natural resources. How to put the brakes on space probes flying at 20 percent of the speed of light is currently being discussed by experts from the Max Planck Institute for Solar System Research in Göttingen, Germany. This poses a real problem because any probe at this speed could sail by the entire Alpha Centauri System in less than a second. The result: hardly any data would be collected. The experts from Göttingen propose to use the gravitational fields of all three stars, Alpha Centauri A and B plus Proxima Centauri, to slow down the probes. They also suggest that the probes could first use a fly-by manoeuvre near our sun to gain momentum for their long haul, before setting out to distant systems, thus requiring smaller laser arrays. The researchers are already discussing their ideas with the Starshot team. Philip Lubin doesn’t expect to witness the results of Breakthrough Starshot, as he said in a German interview: “I’m now 63 years old. I might witness the launching of an interstellar mission in about thirty years’ time. But it will take at least 24 years for any data to be transmitted back from a distant star system.” One reason why Lubin is optimistic about his mission is the fact that for the last 25 years, the power potential of lasers has doubled about every 20 months and costs have been reduced simultaneously. Lubin calls this development ‘photonics revolution’. And the enormous progress in material science, especially nanotechnology, needs to be taken into account, as well as the constant miniaturisation of technical devices, especially computer chips. Incidentally, the Starshot team calls its space probes ‘starchips’ because they’re effectively flying computer chips. Taking into account that this space mission faces many more challenges than conventional missions, and will probably be delayed and have skyrocketing costs, plus unprecedented problems, this science fiction-like scenario might, in one way or another, still come true someday.